Casting has just been announced for Jeff Wayne's Musical Version of The War of The Worlds which is running at the Dominion Theatre from 8th February (press night 17th February) to 30th April. 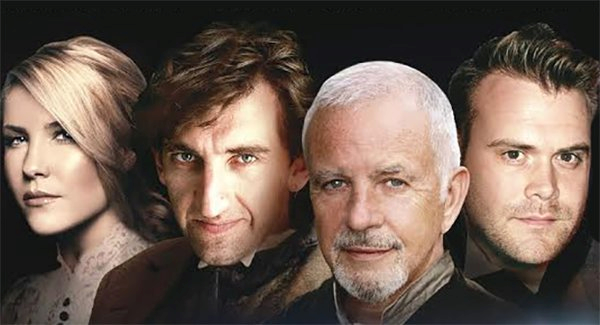 Auf Wiedersehen, Pet star Jimmy Nail will make his West End debut as Parson Nathaniel. He will be joined by pop star Daniel Bedingfield and Sugababes singer Heidi Range as The Artilleryman and Beth. Further casting includes Michael Praed (Dynasty) as George Herbert, Madalena Alberto (Evita) as Carrie and David Essex as The Voice of Humanity. Liam Neeson will make an onscreen appearance as The Journalist. Jimmy Nail was last seen on stage in the Broadway run of the Sting-scored musical The Last Ship in 2014. He is well known for his TV apppearances as Jimmy ‘Oz’ Osborne in BBC1's "Auf Wiedersehen, Pet," for writing, producing and starring in the title role of "Spender," and for creating "Crocodile Shoes" in which he played a country and western singer named Jed Shepherd. The theme song became a chart hit, and Nail also had a No. 1 single with "Ain't No Doubt." He was seen on film as Magaldi in Alan Parker's film version of "Evita." Daniel Bedingfield, the New Zealand born British-raised singer-songwriter shot to stardom in 2001 with the No. 1 single "Gotta Get Thru This," that was followed by five more U.K Top 10 singles including "If You’re Not The One" and "Never Gonna Leave Your Side" and a debut album that sold more than four million copies worldwide. He was a judge on the first series of "The X Factor in New Zealand" and became the winning mentor when his act Jackie Thomas won the competition. David Essex featured on the original 1978 double album of "The War of The Worlds," playing The Artilleryman. Now, almost 40 years later and for the first time since its inception, he returns as The Voice of Humanity. In a long career, Essex has had 19 Top 40 UK Singles—including two No. 1's—and 16 Top 40 Albums. His theatre credits over the years have included the original London productions of Godspell and creating the role of Che in Evita. More recently, he starred in All the Fun of the Fair which is based on his hit own songs. Heidi Range is the longest serving member of the BRIT award winning girl group Sugababes, where she enjoyed six UK number one singles, two Number One albums, eighteen UK top ten hits and five UK top ten albums. She was also formally one of the original members of girl group Atomic Kitten. Michael Praed is probably still best known for his iconic portrayal as Robin of Loxley in the classic television series "Robin of Sherwood" and subsequently the U.S series "Dynasty." Stage appearances have included The Sound of Music (London Palladium), The Pirates of Penzance (Drury Lane), Aspects of Love (Prince of Wales) and The Three Musketeers (Broadway Theatre, New York). Madaleno Alberto was at the Dominion in w014 in the title role of Evita. She has also played Grizabella in Cats at the London Palladium. Other musical theatre credits include Fantine in the 25th Anniversary production of Les Misérables.